This was one hell of a day, mm? Many thanks to our guest posters for providing crunchy brain sustenance for all! And now, as you loosen your bootlaces in preparation for the evening, it’s time to take a moment and appreciate these elegant anime robots. 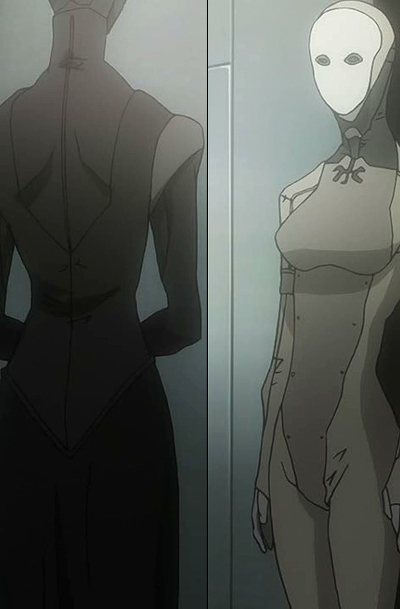 I’ve been hearing about Ergo Proxy for ages but didn’t start watching until last week. Just 4 episodes in so far, I’m admiring the perpetually dusky post-ecodisaster utopia and identifying with the heroine’s utilitarian fashion sense. Of special interest to me, however, are the Entourage AutoReivs – as their name implies they are robotic companions to each citizen and help with everything from shopping to driving to occasional protection. Ergo Proxy is available on Amazon. You guys have done it again- another thing I was unaware of the existence of until moments ago and now helplessly love. Thanks for ruling! 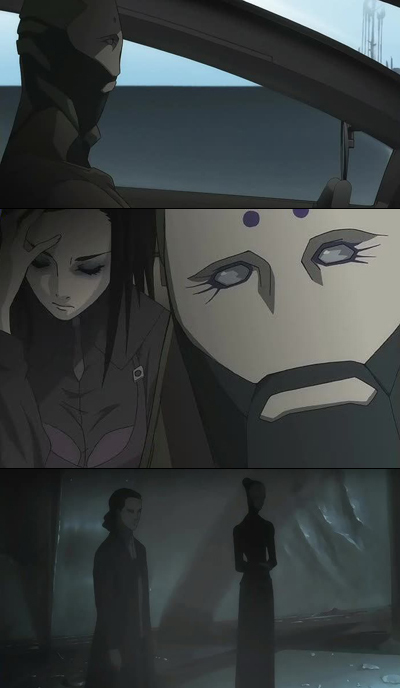 Ergo Proxy is one of the few animes that I was motivated to watch in its entirety. You’ve just inspired me to watch it again. I saw the first several episodes awhile back, and one thing that I found amusing was the number of autoreivs named after continental philosophers. Two medical ones are named Deleuze and Guattari. Also the 4 statue-autoreiv-things that the heroine’s grandfather speaks through are Derrida, Husserl, Lacan, and Berkeley. Will definitely be checking this out! My taste in anime runs to ze oft unheard of (by me), und/or, unpopular, so i appreciate this. Also, I’ve a love of such bots, as this little doodle o’ mine clearly shows. GAAAAAAAH! Internet Explorer won’t run on mee mac, und ye have to have it to use this. Piss, rot und bother. Jerem – I love your doodle so. Ohhhh… I recently finished watching Ergo Proxy myself and though I must admit the last three-four episodes weren’t on par with the rest of the series (almost as if done by another hand, both for quality of the story and for stucture) it still is an excellent view. Initially it might look just another take on the Ghost in the Shell theme of self aware machines, but as the story progresses it gains substance and originality. I’d also highly reccomend the two soundtrack cds (Opus 1 and Opus 2) by Ike Yoshihiro… ambient mixed with simphonycal/classical elements. oh, I love Ergo Proxy, discovered it last year at Anime north and couldn’t resist on the end of the festival, I had to get all the episodes and two posters. Love the colors. Hmm, a friend of mine was raving about this a few weeks ago. I’ll have to check it out. The whole story is layered throughout with many references to philosophers, psychology and obscure text. Cogito ergo sum ‘i think therefore i am’, is where the Cogito virus’ name came from. In the opening sequence there is text from Landnáma which is a very old icelandic recording of their early history. Also is a poem from Michael Angelo…so many juicy bits in there. The series is great, which I wasnt expecting when I saw it. Thanks, Cappy. Checked the link before posting and it seemed fine – for everyone’s protection I’ve linked to Ergo Proxy on Amazon, instead! …and I hate to evangelize here, but this is one of the big reasons why everyone here should be using Firefox, at the very least — any site with messages like “Needs Internet Explorer” is usually big trouble.